and the back of the hands will be hard to distinguish. There are frequent complaints of thirst. Even the severely wounded may complain of thirst rather than pain. The kidneys may shut down. Urine formation either ceases or greatly diminishes if the systolic blood pressure falls below 80 for long periods of time. The person may faint from inadequate venous blood return to the heart. This may be the result of a temporary gravitational pooling of the blood associated with standing up too quickly. HYPOVOLEMIC SHOCK Hypovolemic shock is also known as oligemic or hematogenic shock. The essential feature of all forms of hypovolemic shock is loss of fluid from the circulating blood volume, so that adequate circulation to all parts of the body cannot be maintained. Hemorrhagic Shock In cases where there is internal or external hemorrhage due to trauma (hemorrhagic shock), there is a loss of whole blood, including red blood cells. The diminished blood volume causes a markedly lessened cardiac output and reduced peripheral circulation. This results in reduction of oxygen transported to the tissues (hypoxia); reduction of perfusion, the circulation of blood within an organ; and reduction of waste products transported away from the tissue cells. Under these conditions, body cells are able to carry on their normal functions for only a short period of time. The body tries to restore the circulatory volume by supplying fluid from the body tissues. The result is a progressive fall in the hematocrit (ratio of red blood cells to plasma) and in the red blood cell count. Burn Shock In burn shock, on the other hand, there is a progressive increase in the hematocrit and red blood cell count. This increase is due to hemoconcentration from loss of the plasma fraction of the blood into and through the burned area. NEUROGENIC SHOCK Neurogenic shock, sometimes called vasogenic shock, results from the disruption of autonomic nervous system control over vasoconstriction. Under normal conditions, the autonomic nervous system keeps the muscles of the veins and arteries partially contracted. At the onset of most forms of shock, further constriction is signaled. However, the vascular muscles cannot maintain this contraction indefinitely. A number of factors, including increased fluid loss, central nervous system trauma, or emotional shock, can override the autonomic nervous system control. The veins and arteries immediately dilate, drastically expanding the volume of the circulatory system, with a corresponding reduction of blood pressure. Simple fainting (syncope) is a variation of neurogenic shock. It often is the result of a temporary gravitational pooling of the blood as a person stands up. As the person falls, blood again rushes to the head, and the problem is solved. Neurogenic shock may also be induced by fear or horror, which will override the autonomic nervous system control. Shell shock and bomb shock are other variations of neurogenic shock that are important to the Hospital Corpsman. These are psychological adjustment reactions to extremely stressful wartime experiences and do not relate to the collapse of the cardiovascular system. Symptoms range from intense fear to complete dementia and are manifestations of a loss of nervous control. Care is limited to emotional support of the patient and his evacuation to the care of a psychiatrist or psychologist. 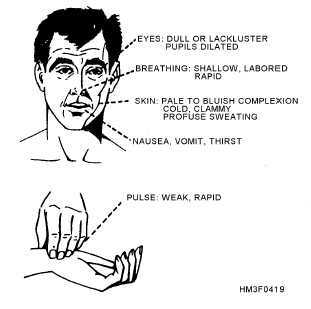 4-23 Figure 4-19.Symptoms of shock.